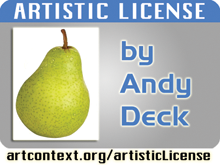 Produce your own customized Artistic License in a matter of minutes using your web browser. Instead of biometrics and radio frequency ID chips, Artistic License embraces freedom, collaboration, sharing, and imagination as keys to a more appealing modernity. Your Artistic License doesn’t require you to look like yourself, and it does not impose factual restrictions. Nonetheless it has the truthiness coveted by authority. And, if you make yours before December 15, 2009, you’ll be eligible for a free laminated edition. Brought to you by the unaided eye and Artcontext of Andy Deck. Licenses can be obtained using a self-addressed stamped envelope. Or, if you get a 2010 Artcontext Calendar, it can be enclosed in that shipment. Send e-mail for details. « AntiWar404: Movement not found?